I finished the Star Wars book 'Heir to the Empire' and immediately (and finally) understood what all the fuss was in terms of Grand Admiral Thrawn. I mean like the internet bloody loves him. More than Papa Smurf himself! He's the chief antagonist of the book and it's quite clear from the first few paragraphs he feature in that he's the real deal. Inspired by this belated introduction to the Big Blue Chiss, I thought I'd present some facts and trivia about him. His appearance in season 3 of Star Wars Rebels marks the first occasion that an extended universe character has been placed in the new formal Star Wars Canon. We believe that the second character to do get this kind of treatment was Saw in Rogue One going from Clones to the Big Screen. Zahn has said that Thrawn's character is a composite of various historical and fictional personalities, including Erwin Rommel, Robert E. Lee, Hannibal Barca, Alexander the Great, and Sherlock Holmes. Some of those names are the greatest military leaders of history. Check out this handy list of 111 Star Wars film trivia sets. 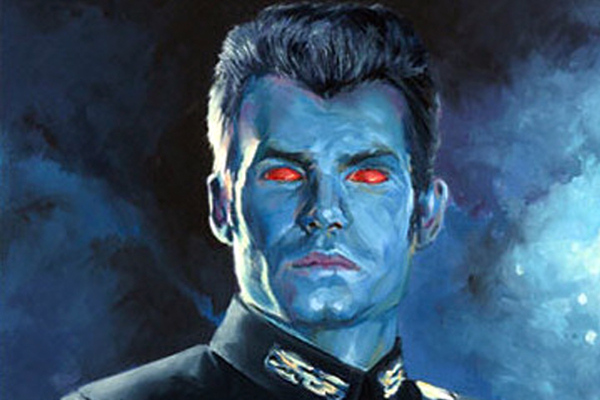 Thrawn's species was never revealed in the original Thrawn trilogy, but to anyone who's ever read E.E. "Doc" Smith's Lensman novels his appearance was quite obviously that of a Kalonian, the most visible race in the Boskone Empire which is the major power opposed to the civilization the Lensmen and the Galactic Patrol serve and protect. Since the Lensman series is something of an ur-text for the subgenre of galactic-scale space opera of which Star Wars is now the most popular example, I suspect that was an intentional tribute on Zahn's part. If I ever get the chance to speak with him at a convention or something of the sort, I intend to ask.